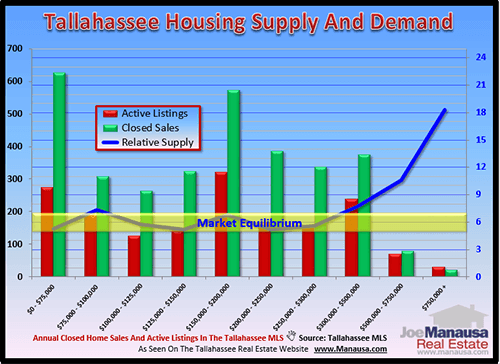 In case you did not see the newest supply and demand report, let me tell you that we are slowly seeing balance return to the Tallahassee real estate market. We publish these reports within the first five days of every month, and they are used to track both the real and relative supply of homes for sale in Tallahassee. This month, we can actually see market equilibrium approaching. It is generally accepted among real estate professionals that a market is in balance (market equilibrium) when the relative supply of homes listed for sale reaches six months of supply. We can determine this measurement by dividing the number of houses listed for sale by the monthly average number of homes sold during the past year. The table above shows the relative supply of homes for each area and price range, and if you have been tracking these reports (see five years worth of these monthly reports at manausa.com/market-reports), then you know we are getting close. The eastern side of Leon County is sporting the best numbers, whereas the western side is possibly years behind with the over-building of investment property that began more than ten years ago. But with roughly 2/3rds of all Tallahassee homeowners living on the East side of town, those numbers starting with a "6" or lower is should elicit some hard earned and long awaited smiles. When the relative supply of homes drops to 6.0, historically we expect to see real estate appreciation from 3 to 4 percent each year. If this is your first time to visit the Tallahassee Real Estate Blog, then I encourage you to read some of our recent articles on luxury homes and why we have grave concerns for these homeowners. Values among homes for sale in the upper end of our price ranges fight a different supply imbalance than do those towards the median price point in Tallahassee. If you would like to know more about how our monthly supply and demand reports for the Tallahassee real estate market can be used to assist you, simply drop me a note and we can schedule a time to discuss your specific situation and needs.